The last time I checked, it is supposed to take approximately 2 weeks in UK to get the ABRSM exam result. Well, not here in Indonesia. I took the 5th grade theory exam, and I have to wait for almost eternity for the result. When it finally arrived, I had only 2 weeks left to register for the Grade 8 practical (the 5th grade theory is a prerequisite). Well, the deadline is just getting shorter. After the Grade 8 practical, I have to wait another 3 months for the result, which is presented in just the examiner's comment sheet. Another 2 months passed, and I finally received the Grade 8 diploma. After still another 2 months (7 months from the exam), I received an invitation to join the high scorer concert. Registration deadline? 1 day. Great job! In the High Scorer Concert, I'm supposed to play one of the exam piece that receives the highest score. Which one? Well, they told me which one to play, 3 days before the concert. So, they really do a marvelous job here. When they have to send something to the candidate, it takes forever. But when the candidate has to send something to them, they give a very short deadline. Anyway, I'm going to perform JS Bach BWV 1035 for flute in Grand Serela, Bandung, this Saturday, 9 May 2009. My accompanist, Andrew Sudjana, has not recieved the score yet by the time of this writing. Classical music concert does not get any better than this. I created a MIDI file to analyze a 1972 performance of Dave Brubeck Quartet. The song is the world-famous "Take Five", the tune that I took as a model for my irregular music. The spirit is simple, a complex rhythm does not have to sound difficult or even bizarre. It can sound astonishingly simple and pleasing. The result really is a timeless masterpiece. Creating a MIDI file to mimic a real performance is definitely not possible with today's technology. Even the same human performer cannot repeat the performance exactly. It shows that music is more than just melody, rhythm, and harmony, all of which can be repeated or copied with almost surgical precision. The precision, in fact, is one thing that separate us from machines. The subtlety of human-made imperfection in the intonation, rhythmic, or non-ideal timbre, is the thing that created the charm of a live music performance. Software synthesizers came up with solutions that basically try to put random imperfections at the MIDI output. However, the result is still unsatisfactory. There is something more than mere random imperfection. Boehm, the inventor of the flute, was known as a very fine flutist, composer, scientist, and a master silversmith. Being a flutist, a composer, and a scientist already, I decided to take up the one last required skill, metal smithing. So I made a trip to Kotagede, Yogyakarta with a friend of mine, Himawan, to learn this ancient craft in Studio76 under the guidance of Mr. Agus, a local silversmith. Kotagede is the center of Indonesian silver art, home to hundreds of craftsmen, located at the southern part of Yogyakarta. The first one from the left was a mobius ring made by Himawan. The other two are mine, a G-clef liontin and a ring. So, while we're there, we decided to visit some architectural jewels of the city. The Tamansari Water Park (former residence of Mataram's Kings), the Kraton Yogya (current residence), and the megalitics structure scattered throughout the city, especially the Sewu Temple, Prambanan Temple, and the Ratu Boko Complex. We didn't have enough time to visit the famous Borobudur which is out of range of the city bus. The tour is completed by a trip to Dagadu (T-shirt factory) and a Batik gallery, and of course, "Gudek" for lunch. How great? Finally, the world's best notation editor runs on Linux! This program is the only one that keeps me rebooting back to Windows for a very long time. I'm still waiting for a Linux native notation editors. So far MScore and NtEd look promising, but they are still under heavy development, and it would take years for them to replace Sibelius, not mentioning another years for a converter that will allow me to open hundreds of my old .sib files. While sibelius 4 has been running on Linux for quite a while, the line break problem stops most people from runing it under Linux. The bug is, well, a bug. Minor, but annoying enough to render the software barely usable. Any text longer than one line will not render correctly, the software ignores the line breaks, so the all th e lines will print one on another, making them impossible to read. To make things worse, it affects the time signatures, both numbers are printed on the same spot. But now, thanks to the wine developers, the bug is gone for good. 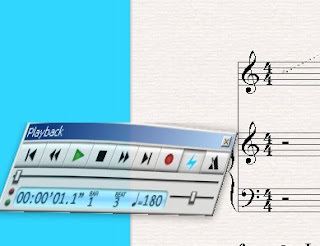 You can see from the screenshot that the time signatures are printed correctly, with Compiz fusion's wiggly windows effect applied. So finally, Linux becomes a usable platform for musicians. 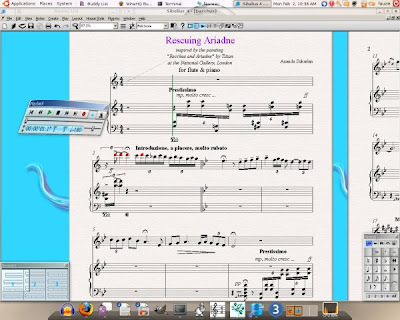 Currently my favourite software lists include JACK (Low latency audio connection kit), Ardour (digital audio worksation) and finally, a notation editor, the one and only Sibelius 4. Most of these flutes are of tourist's quality. They do looks good but sounds awful. Well, I'm not talking about the sound quality as for traditional flutes, people takes breathyness and the lack of projection as a thing of beauty. But their intonation is so terrible that they can't play any comprehendsible tune. From all 6, only the 4th and the 5th flute from the left has reasonable intonation. Still, their badly shaped flageolet and embouchure holes limit their overblowing capabilities. For the 1st two, their aspect ratio is just ridiculous, there is no way you can get correct intonation out of that, but somehow the Balinese are very fond of those fat flutes, and you can readily find them in their gamellan ensamble. Off course, I prefer the slender Sundanese flute supermodel. That's me, with the oboe. Behind me is Giovanni, the cellist. I got this picture from the Christmas 2008 Concert that I did with my old high school friend, Ronny. I haven't seen him for years, but somehow we worked together on this project. He turned out to be the conductor, a very good one, for his church choir at GKIM Gloria. Somehow he managed to found me, and asked me to create the orchestral arangement for his church's Christmas concert. I happened to share the arrangement project with my former trumpet instructor, Mr Jodi. It still amazes me up to this day, how Ronny managed to build such a solid choir from a mere 300-strong congregation. It looks like 1 out of 5 members of the church has joined the choir. Amazing feat, some says it is a miracle, although I'm not that kind of religious person. 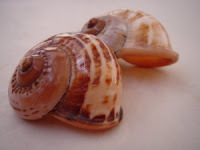 I found this particular kind of sea shells, the one that has a naturally shaped embouchure hole. 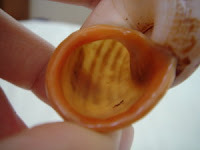 Take a look at the picture, it looks like a flute's lip plate. 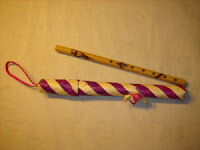 Using a weird embouchure similar to the Egyptian Ney, they can readily make a whistle-like sound. Lipping technique gives each a range of about major third between the lowest and the highest note. So I purchased a pair of these, the biggest they have and the smallest (the one in the foreground is actually the smaller one, but appears larger because of perspective). Together, they give a range of approximately a fifth apart. On the very same trip where he brought back the Cambodian Khloy, my friend also found the legendary vietnamese jaw harp, or Ken La in the local language. Made with brass, this might be the stradivarius of the jaw harp world, producing a sound so loud that it doesn't really need to be put into one's mouth to be audible. I put this Ken La head to head against the local (for me, local means Sundanese) jaw harp, known as Karinding, which is made from bambo. I recorded both with the same setting, but I have to play the ken la slightly further from the mic as it drives my mic of the scale on this setting. Of course, bamboo produces a much sweeter sound, and it is much safer to put into one's mouth! 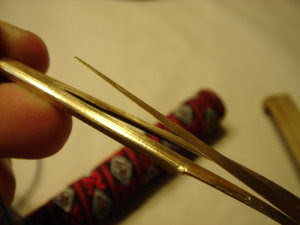 However, in the jaw harp world (which is a very quiet instrument), loudness is everything, so a lot of player are willing to risk their tongue and lips to play the metal jaw harp. The craftmanship is quite extraordinary fur such a simple instrument, and it comes with a very nice, decorated carrying case. You can see from the 1st picture the side by side comparison of the vietnamese Ken La and the Indonesian (Sundanese) Karinding, with 100 Rupiah and US Quarter for scale. The 2nd picture shows the brass tongue of the Ken La. A friend of mine did a trip around South East Asia, and found this cute little flute in Cambodia. 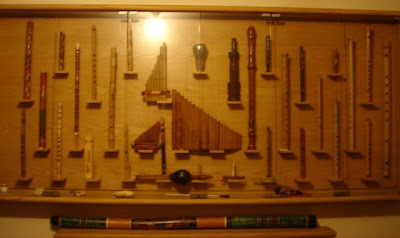 The Khloy, as how locals called it, is a recorder-type instrument. 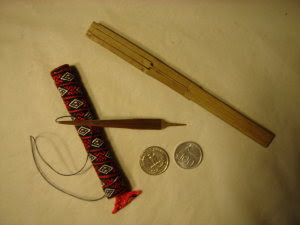 It is curious that the construction of flageolet is fundamentally the same with the European counterpart, with a block of wood inserted into the tube (as opposed to the leaf-ring construction found in Indonesia). The bamboo itself is very small, with very thin wall. In fact the bore is the smallest among my collection. It has 7 finger holes, but the last one does not seem to give much effect to the pitch. The sound is very bright, but not as piercing as one would expect from such a small flute. It is decorated with pyrography technique. The pyrography is quite coarse, to be honest, but it does gives the required aura for this traditional instrument. But the most interesting part of this piece is the casing it comes with, as you can see from the picture. I don't know any Cambodian music, but the flute apparently gives certain kinds of music naturally. Although equiped with flageolet, it allows some flexibility to the emboucure, unlike the rigid European recorder. And it takes some experiments to produce its best sound. Here is the recording of the Khloy, without any prior knowledge of the music it was made for. Enjoy. This is a flute specimen I obtained from Tana Toraja, Sulawesi. 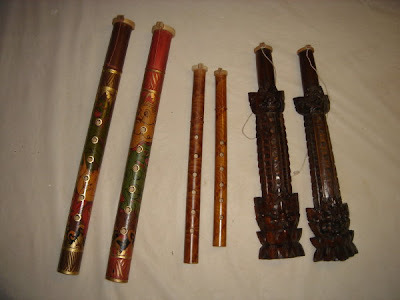 It looks like an ordinary bamboo traverse flute with 6 fingerholes, but with very nice and colorful finishing touch. 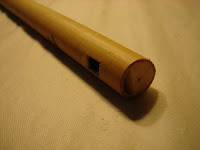 The bamboo itself is very thin,thus producing its particular sound. I'm not sure how it is supposed to be played, but I think this traditional Toraja melody is always good on any flute. Listen to its sound here. 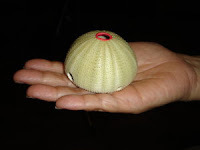 This is an instrument I created last year, made from a sea urchin shell. 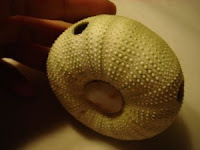 I applied thick internal lacquer to the shell as naturally, the sea urchin shell is very porous and not suitable for a wind instrument. After sealing the pores completely, I shaped the embouchure hole, and drill 4 finger holes in it following John Taylor's ocarina design. With this scheme, the instrument, pitched in concert C, is capable of producing 1 fully chromatic octave. 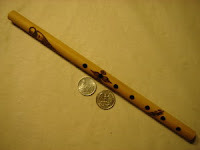 However, with the open, flute style embouchure hole (as opposed to the flageolet ocarina style embouchure hole), lipping technique can bring the low notes of this instrument all the way to G below the treble staff.